Estep & Associates have spent over 28 years bringing the past to life. Filling the former dry-goods store is everything from "Antiques to Yuletide". 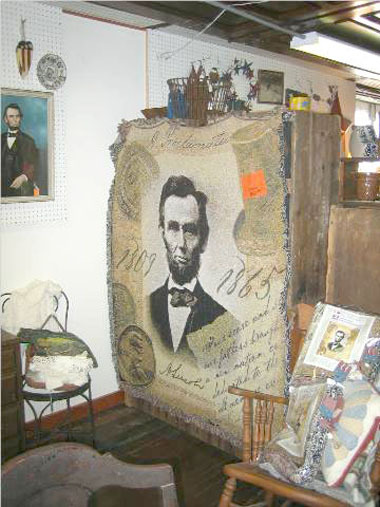 Among the aisles of this quaint step back in time you'll find big items, small items, personal mementos and commercial oddities. With more than a dozen additional dealers showcased Betty guarantees an encounter not to be missed, as you stroll through rustic heirlooms, collectibles, antiquities, craft projects and unlimited possibilities for discovery. Overlooking the Menard county courthouse, there's a real sense of yesteryear awaiting your adventure. Come explore our treasures and enjoy the rich texture of the town Abraham Lincoln, while living in nearby New Salem, surveyed as a young man.